Want to invest $10 to win $25,000 playing fantasy baseball online? If you already signed up for FanDuel.com you may already be making money playing daily fantasy sports online but for all you baseball fans, there is a huge promo tournament happening that you should not miss. 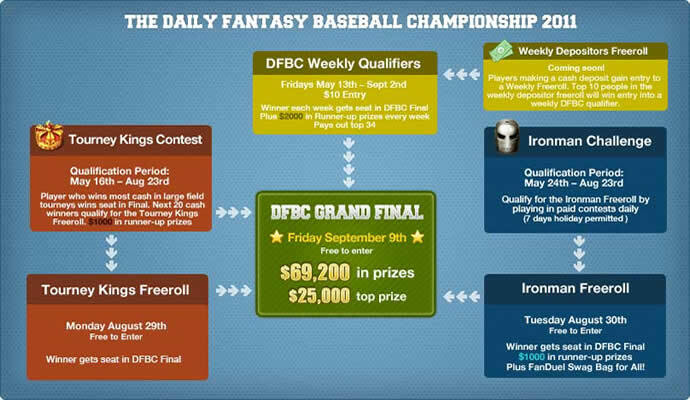 The FanDuel Daily Fantasy Baseball Championship (DFBC) starts May 13th and and extends to September. For just $10, you can win a seat to play in the September 9th finals for up to $100,000 in cash prizes and a grand prize of $25,000. This is the largest Fantasy Baseball Contest online in history! To enter, just join FanDuel, pay the $10 fee, pick the players for the upcoming Friday’s baseball games and if you score the most points, you get a seat for the final in September to play for a share of the $100,000 in prize money. It is that easy! There are also $2,000 in weekly prizes so even if you don’t win a seat in the final, you can still win money many times with this promotion. If you are a regular FanDuel player and don’t want to enter the weekly games, there is good news - you may still win an entry through the Ironman Challenge. From May 24th to August 23, if you play daily with no more than 7 days off, you will be entered into a freeroll tournament on August 30th to play for a DFBC seat. So just for playing at FanDuel regularly, you could be entered into the big tournament - the FanDuel Daily Fantasy Baseball Championship (DFBC). You can enter as many teams as you wish to win a seat into the big tournament, but don’t fret if you don’t win, the Tournament Of Kings contest will award 2 seats to the DFBC using accumulated points through all of your entries. So even if you don’t win, you could still be good enough to win a seat to the finals.